Flying planes in this magical airspace is silly, charming, and fun. Sago Mini Planes is an airplane adventure filled with zany things floating in the sky. Featuring simple touch controls, the app lets your toddler or preschooler pilot planes and explore the skies over a variety of locales, including a mountain, a beach, the artic, a city, and the ocean. Players can even fly through a thunderstorm or zoom up into outer space. The app opens to an airplane hangar. Would-be pilots scroll through 10 planes and tap on the one they want to fly. Next, they select which of the five Sago Mini animal friends (Jinja the Cat, Robin the Bird, Harvey the Dog, Jack the Rabbit, and Rosie the Hamster) to take on this trip. The planes seat either two or three passengers. By pushing the on-screen arrow, players make the plane takes off. In the sky, kids can decide their altitude while executing loop-the-loops, going fast or slow, and even flying upside down. They will find all sorts of things floating or flying, including pigs, penguin-astronauts, balloons, pizza planets, and musical stars. By flying up far enough, travelers will eventually enter outer space! This app makes flying in an airplane seem like fun. 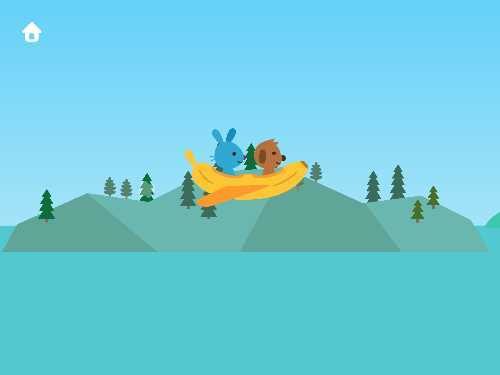 With delightful animal friends in the cockpit and fanciful objects and wacky characters floating in these friendly skies, this app will keep your child smiling. The developers spent a lot of time creating whimsy, and it shows up in unexpected and delightful ways. If you pop a rainbow balloon, your exhaust emits rainbow colored smoke. 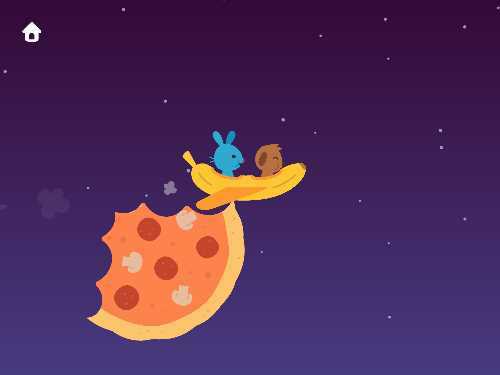 Fly through a cloud shaped like an ice cream cone, and the passengers come out with yummy desert all over their faces. There is even a wormhole that morphs you to a different part of the sky. Also cool is your ability to land at any time. Just head to the ground, and a runway appears. 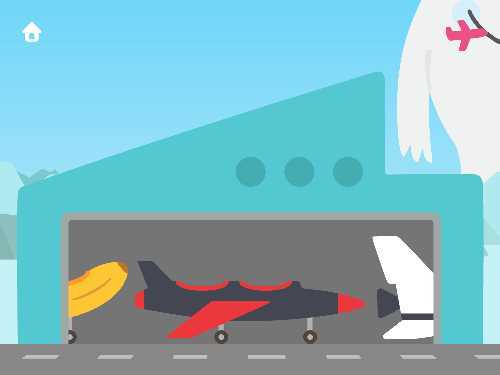 This allows kids to swap out planes; and since so many have silly designs (there's a bunny slipper plane and a flying banana to name a few!) kids will want to go again in a different plane. Even better, the app recreates your trip with a photo slideshow, which helps kids to remember what they saw. The plane's perpetual motion can be a little frustrating for the youngest flier. 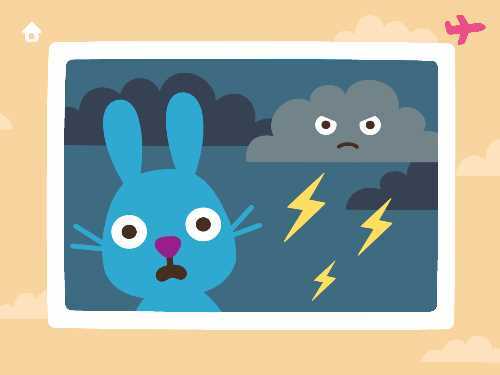 At times, the constant movement interrupts your child's ability to enjoy all the hidden surprises in the sky. Frequently, you see something worth exploring; but by the time you have turned around, it is already gone. However, this is great motivation to play again. My suggestion would be for a parent and child or two kids to play this app together. Sago Mini Planes makes use of multi-touch -- meaning that the app responds to more than one finger on the screen at a time. That way one player can use a finger to pilot the aircraft, while the other taps on things passing by, including the stars that sing. 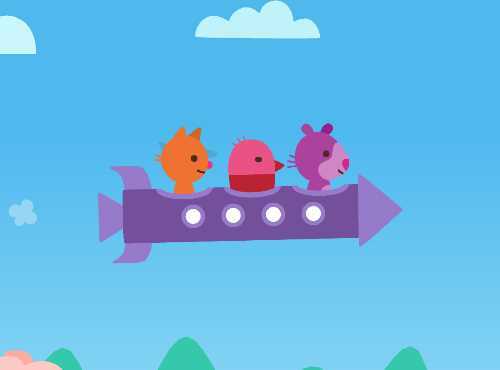 Sago Mini Planes is a fun first app for toddlers and preschoolers who are interested in vehicles, planes, and trains. It is also a helpful app to download before taking your child on an airplane. Nothing like piloting your own plane in the app while you are flying across country. If your kids fall in love with these characters, there are many more apps that feature them. Check out our list of Best of Sago Sago Apps. This kids' app review of Sago Mini Planes was written by Jinny Gudmundsen.